^ a b c d e f g "World Airline Census 2018". Flightglobal.com. Retrieved August 21, 2018. ^ "Boeing refine 757 flight deck". Flight International. October 6, 1979. p. 1098. ^ a b c Rinearson, Peter (June 19–26, 1983). "Making It Fly". Seattle Times. Archived from the original on October 11, 2012. Retrieved October 26, 2014. ^ a b c d Norris, Guy (October 21, 2003). "Sales drought takes 757's scalp". Flight International. Archived from the original on November 5, 2012. Retrieved July 27, 2011. ^ a b Norris, Guy (November 17, 1999). 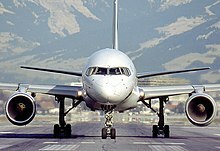 "Boeing looks at 757 slowdown". Flight International. Archived from the original on May 20, 2013. Retrieved July 27, 2011. ^ Kingsley-Jones, Max (April 11, 2003). "Omens good for old 757s despite production axe". Flight International. Archived from the original on May 22, 2013. Retrieved July 27, 2011. ^ a b c "Converted Boeing 757-200 freighter enters service with DHL". Flight International. March 20, 2001. Archived from the original on May 22, 2013. Retrieved July 27, 2011. ^ a b c d "Very special freighters". Flight International. September 19, 2000. Archived from the original on November 5, 2012. Retrieved July 27, 2011. ^ "As fuel costs spiral, winglets are a simple way for airlines to cut fuel consumption". Flight International. June 27, 2008. Archived from the original on July 3, 2008. Retrieved July 27, 2011. ^ Ostrower, Jon (September 5, 2010). "Icelandair's 757 replacement dilemma". Flight International. Archived from the original on September 9, 2010. Retrieved July 3, 2015. ^ Schofield, Adrian (July 20, 2005). "Boeing's 737-900ER Seen As Direct Competitor To A321". Aviation Week & Space Technology. Archived from the original on March 22, 2012. Retrieved July 3, 2015. ^ "Icelandair Takes First Boeing 757-200 with New Interior". Boeing. April 25, 2000. Archived from the original on June 19, 2000. Retrieved July 3, 2015. ^ "Heath Tecna to unveil Project Amber for B737s and B757s". Northwest Business Monthly. 2011. Archived from the original on March 20, 2012. Retrieved July 3, 2015. ^ "Heath Tecna unveils Project Amber interior". Aircraft Interiors International. Retrieved July 3, 2015. 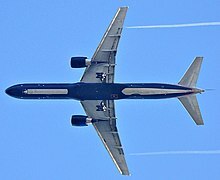 ^ "Boeing 757-300 Background". Boeing. Archived from the original on November 4, 2013. Retrieved July 3, 2015. ^ a b c "North American Airlines and VT Systems plan conversion of Boeing 757-200 to Combi configuration". Global Aviation Holdings Inc. December 17, 2010. Retrieved July 3, 2015. ^ a b "757-300 Technical Characteristics". Boeing. Archived from the original on November 2, 2013. Retrieved July 3, 2015. ^ a b c "Factsheets: C-32". United States Air Force. Archived from the original on June 13, 2009. Retrieved July 3, 2015. ^ "'757 EcoDemo Focuses On Laminar And Active Flow'". Aviation Week. March 23, 2015. Retrieved March 23, 2015. ^ Moody, Elyse (August 5, 2008). "ST Aero Redelivers Combi 757 to RNZAF". Aviation Week & Space Technology. Archived from the original on May 5, 2013. Retrieved July 3, 2015. ^ Guevera, Íñigo (2009). "Defensa Nacional – Ejército, Fuerza Aérea y Marina" (PDF) (in Spanish). Seguridad con Democracia. p. 304. Archived from the original (PDF) on March 28, 2012. Retrieved July 3, 2015. ^ "Check out 'Trump Force One' — Donald Trump's personal Boeing airliner". Business Insider. Retrieved January 16, 2017. ^ "DHL & Lemuir Consolidate Logistics Business in India". DHL Aviation. May 24, 2007. Archived from the original on January 22, 2011. Retrieved July 3, 2015. ^ Kingsley-Jones, Max (October 3, 2010). "BA goes retro for 757 bye-bye". Aviation Week & Space Technology. Archived from the original on October 18, 2012. Retrieved July 3, 2015. ^ a b "Investigation Report AX001-1-2" (PDF). German Federal Bureau of Aircraft Accidents Investigation. May 2, 2004. p. 110. Archived from the original (PDF) on January 23, 2007. Retrieved July 3, 2015. ^ "Plane crash Britons due home". BBC News. September 15, 1999. "Type Certificate Data Sheet EASA.IM.A.205" (PDF). European Aviation Safety Agency. December 17, 2015.